With its strange name, The Museum Club , it might come as a surprise that it’s one of the liveliest bars in town. Exciting band lineup, amazing lodge decor. Beautiful hard wood dance floor with lots of space. Stocked bar and service beyond compare. Locals favorite! What can I do at the Museum Club? 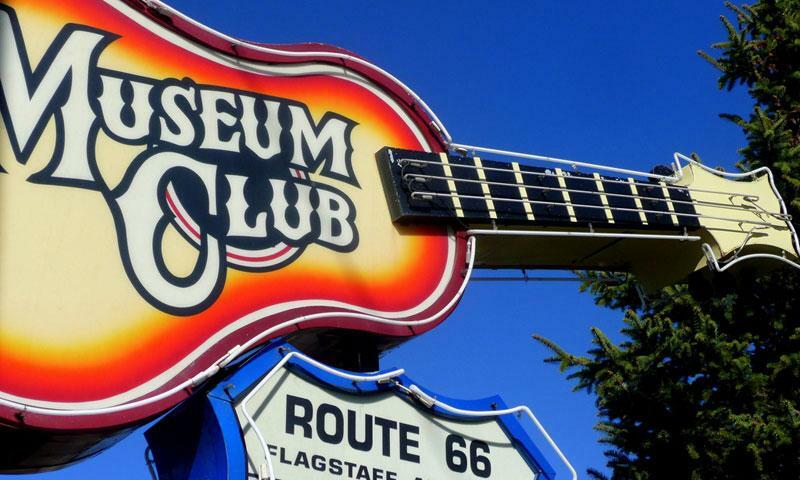 The Museum Club Flagstaff is a classic Route 66 roadhouse with a full bar and plenty of dancing. They do lunch, dinner and, of course, drinks. With its woodsy exterior and country feel it is a great place to relax and have a hog-killin time or just a good night on the town. They host small country music events and karaoke on Monday and Thursday nights. Not only is it popular with the locals, but it has a rich history. Where is the Museum Club? The Museum Club is located at 3404 East Route 66, Flagstaff, directly next door to the only bowling alley in town, Starlight lanes. Take a cab so you don’t have to drive. When is the Museum Club open? It is open Monday through Saturday 11:00 a.m. to 2:00a.m. and Sundays from 11:00 a.m. to 9p.m. How much does the Museum Club cost? There is only a cover charge when there is live music at the bar. The cover for those nights is $5. And of course, you pay for any drinks and food. If you have questions you can call (928) 526-9434 or visit their website http://www.themuseumclub.com/.